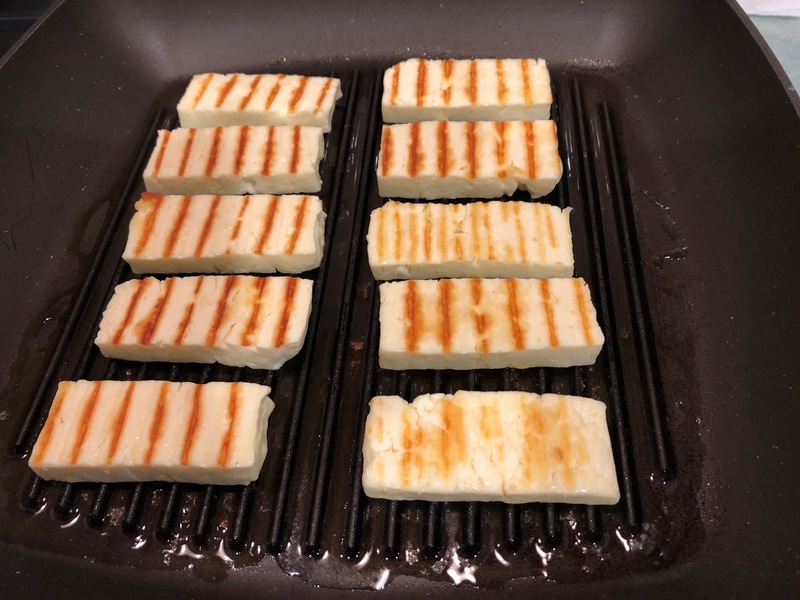 In a recent post, I mentioned a recipe which had introduced us to a “new genre of summer dining pleasures”. Now I will tell you what I meant by that and explain how we prepared the salad and applied its logic to other ingredients. It is common enough for a salad to include salad leaves and a protein. Think of the classic Caesar salad and its many variations. I have been making that style of salad for at least 25 years. And it is not unusual for a salad to consist of a mixture of vegetables and fruit. Think orange and fennel, or, with some nuts, the classic Waldorf. Then there are the many different salads built on a foundation of rice, lentils, pasta etc, some of which include vegetables, fruit and protein. 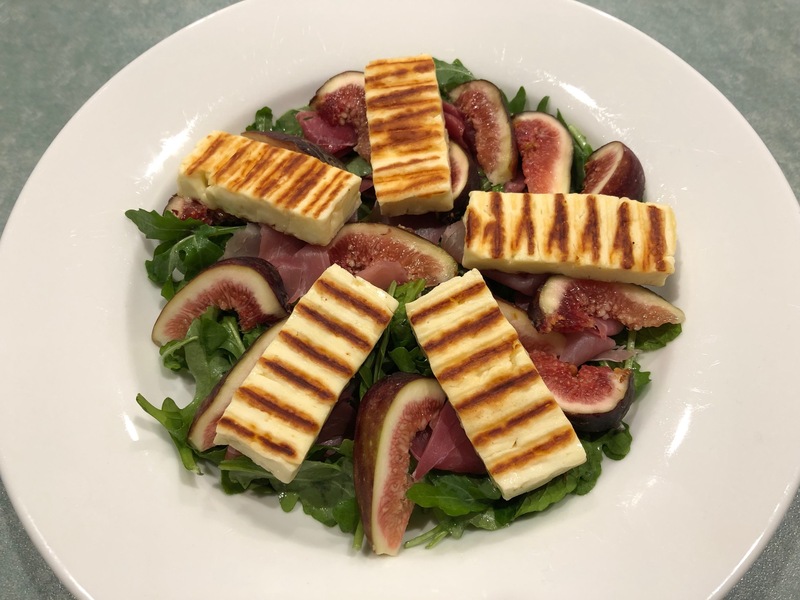 In Melbourne, black figs begin to appear on our greengrocer’s shelves around mid-December, which is when we found a Neil Perry recipe for a warm salad featuring leaves, fig, prosciutto and grilled halloumi. We pared the recipe back by doing without the pine nuts and the sumac. 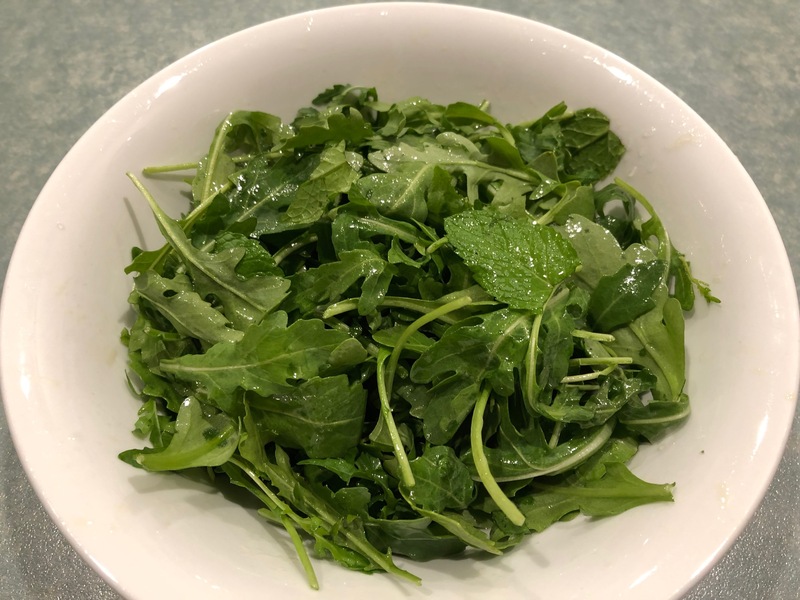 And we dressed the salad by tossing the rocket and mint leaves with some mild olive oil and lemon juice before assembling the salad, as shown in the first photo. 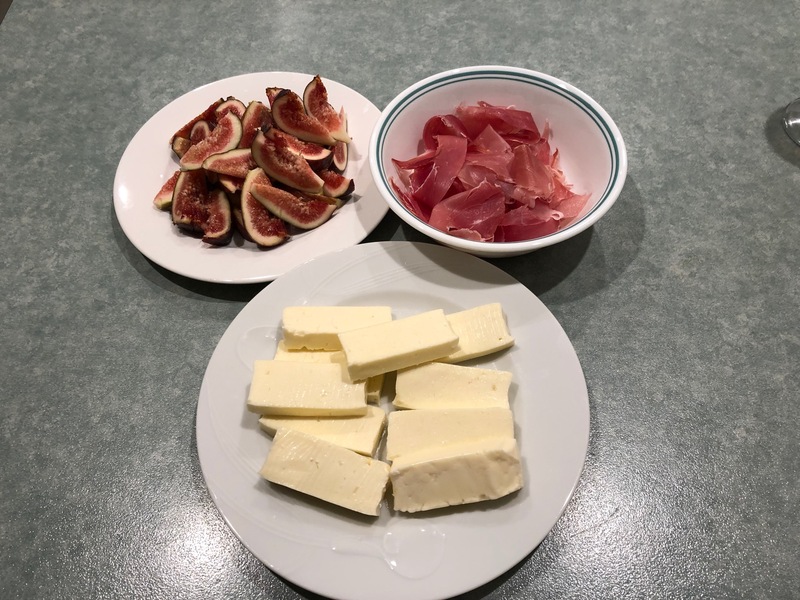 The salad is assembled by placing a mound of the dressed leaves in a wide-based bowl, followed by pieces of torn prosciutto, narrow wedges of ripe fig and then the halloumi. 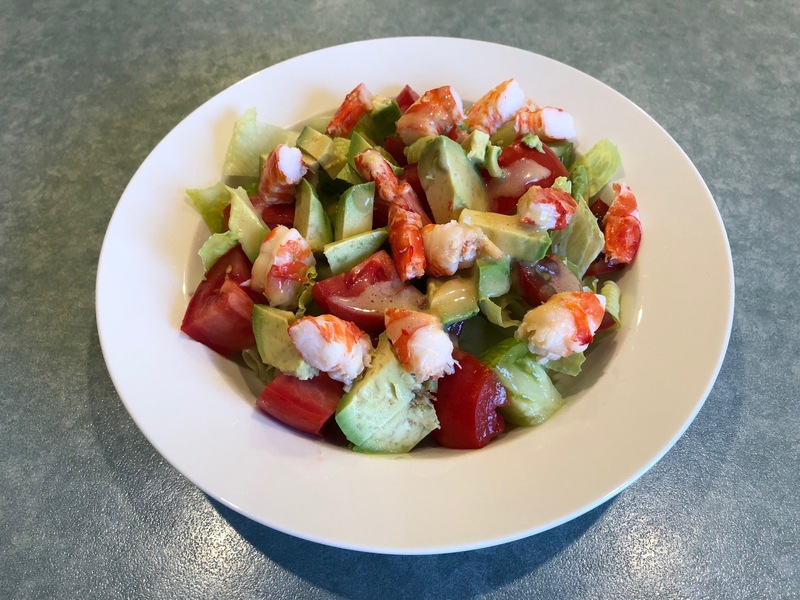 Delighted by the satisfaction of preparing and eating this salad, we went on to apply its logic to other combinations of ingredients to go with various types of salad leaves. These included: prawn, avocado and tomato; ditto with caramelised mango replacing the tomato; poached chicken breast, fig, avocado and prosciutto; and ditto with fig being replaced by the mango. Fig season is drawing to a close now but, thanks to Neil Perry, we have many happy palate memories that will sustain us until next December. 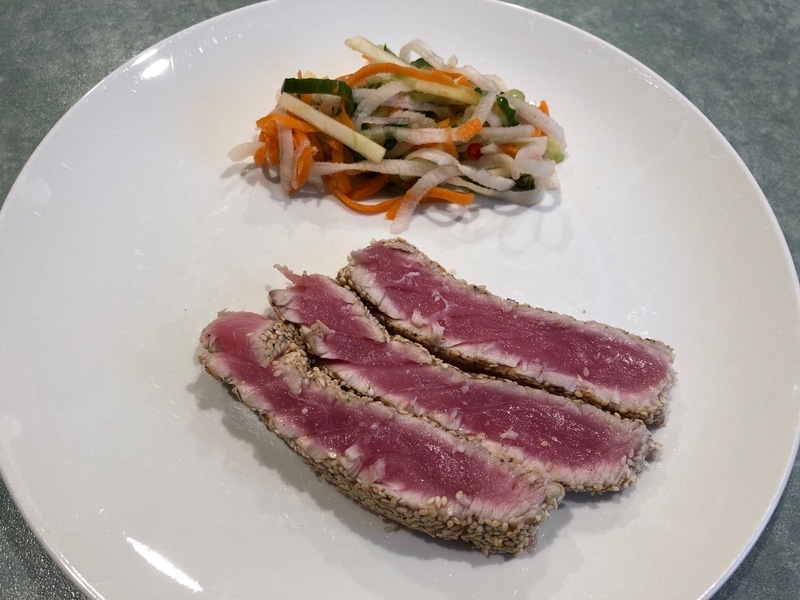 How do I explain why Maggie and I have reached the age of 65 without ever cooking sesame-crusted tuna? Ignorance? Carelessness? Bloody-minded commitment to European culinary conditions? All three of those reasons and probably more besides. 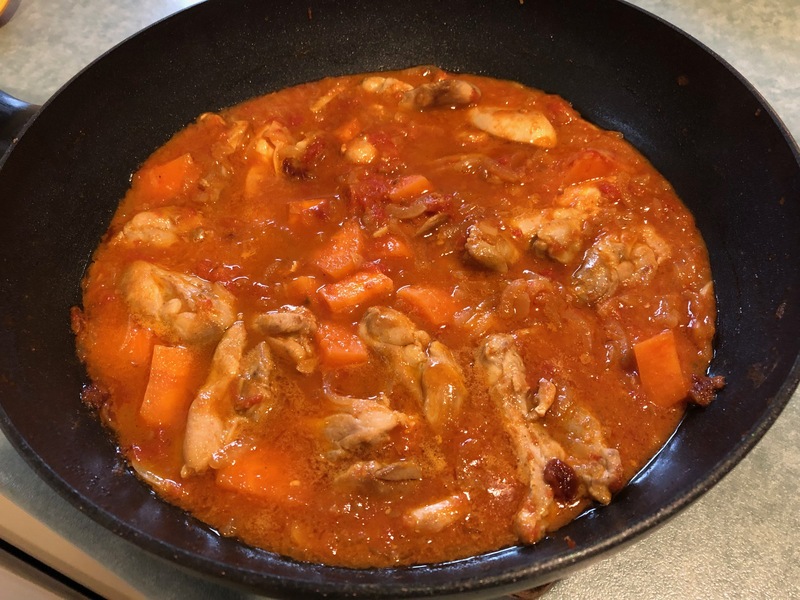 Anyway, I am consoled by the fact that we regularly introduce ourselves to new home-cooked dishes of food, at an average rate of about one per week; and that we are willing to order unfamiliar dishes when we travel overseas. 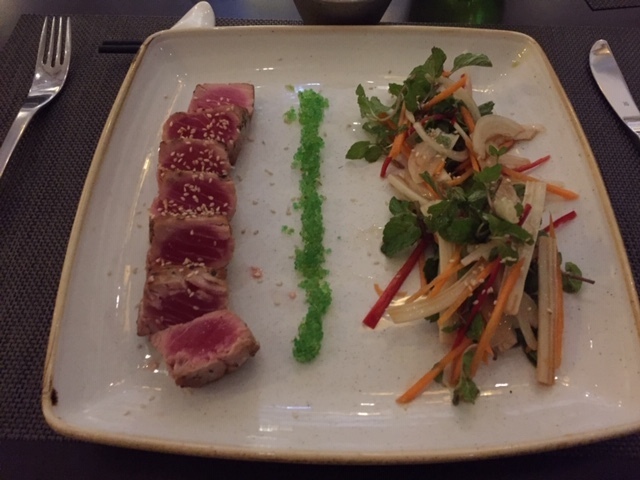 The tuna was served with a refreshing side-salad and a line of wasabi ‘dust’. By the time we had left Da Nang for home, we had begun to bookmark recipes for the tuna, with a view to preparing it in our kitchen, sooner rather than later. Numerous online recipes are available, generally following the same method for the tuna component. This is what we did. For starters, it is critical that the tuna is very fresh, ie sashimi quality. 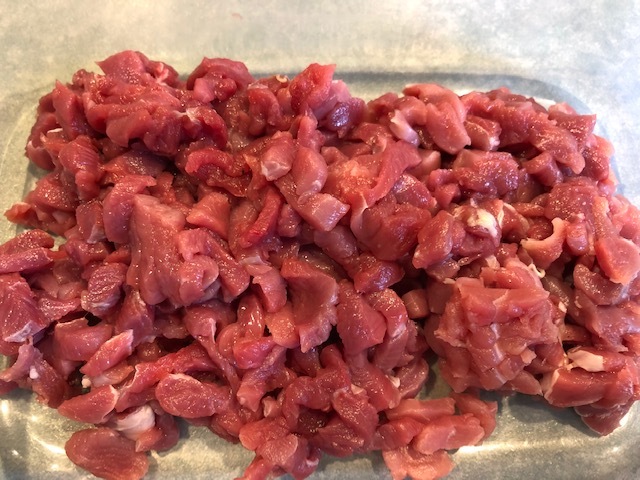 Secondly, we suggest that you take the piece(s) out of your fridge about 20 minutes before you cook them, so it is not unpleasantly cold in the middle when you serve it. Then you should season it with some salt and pepper, to your own taste, before you use a wide-based bowl to coat it generously with raw sesame seeds. We just used white seeds, ie the ones that have had their black hull removed. Don’t worry if there are gaps between the seeds, revealing the pink flesh. They will aid the cooking process and, speaking from experience, will also come in handy if you forget to season the fish first. But before you cook the tuna, you need to organise the rest of your plate. You’ll need a dipping sauce. The easiest option is a mixture of wasabi paste and soy sauce, preferably the soy sauce designed for having with sushi. Or you could kill some time by making something more elaborate, such as the wasabi-ponzu sauce you’ll find here. Given our liking for fiddly recipes, it is a safe bet that Maggie and I will head down that track quite soon. And you need a salad. We chose to attempt a facsimile of the salad we were served in Vietnam. 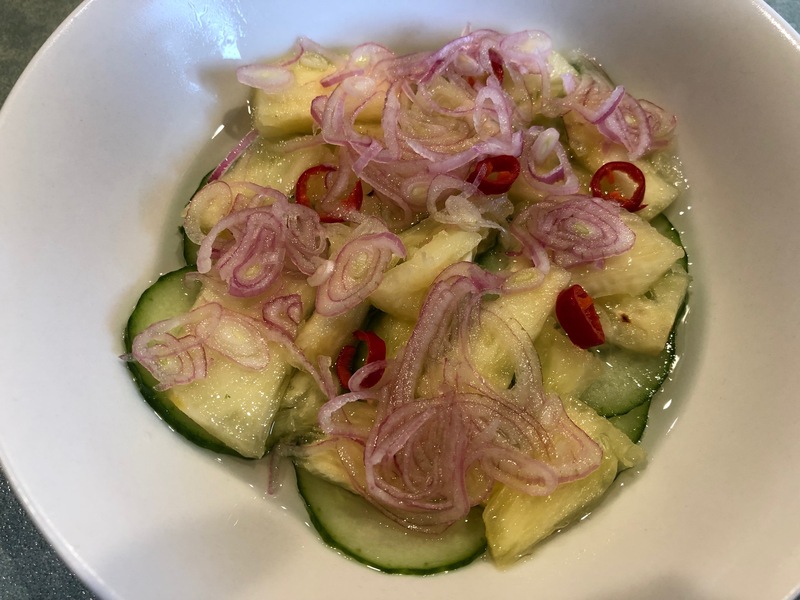 Our chosen ingredients were peeled daikon, peeled carrot, cucumber, mint leaves, chilli and the sweet & sour dressing that Adam Liaw had introduced to us. The first three of those ingredients were prepared using our spiraliser, a utensil that was invented to separate backyard zucchini growers from their spare change. As each strand emerged from the spiraliser, Maggie just tore them randomly and put them in a bowl. Then she added the other ingredients, taking care with our homegrown hot chilli, tossed the salad by hand and put it on the plates ready for the tuna to be cooked and served. Here’s how it turned out. Not bad looking for a first attempt! And it was quite delicious. Over the last three months, Maggie and I have made an unusually large number of salads, including various single-bowl salads that were complete meals in themselves. Why so? Well, it has been a long, warm, dry summer in our corner of the world. So, refreshing salads have appealed much more than cooked vegetables. Secondly, we defied the outlook for dry weather by planting cucumber and zucchini plants. We did produce an abundant crop of both vegetables, but at what cost we will only know when the next water bill arrives! However, armed with our supply of long, green things and stimulated by new recipes, our repertoire of salads blossomed and quickly neutralised my lingering longings for carbs. Now, cucumbers tend to get a bit lost in mixed salads; they can’t compete with other, more illustrious ingredients. So, we mainly use them peeled and diced in a raita, with yoghurt and chopped mint, to accompany a fish curry. 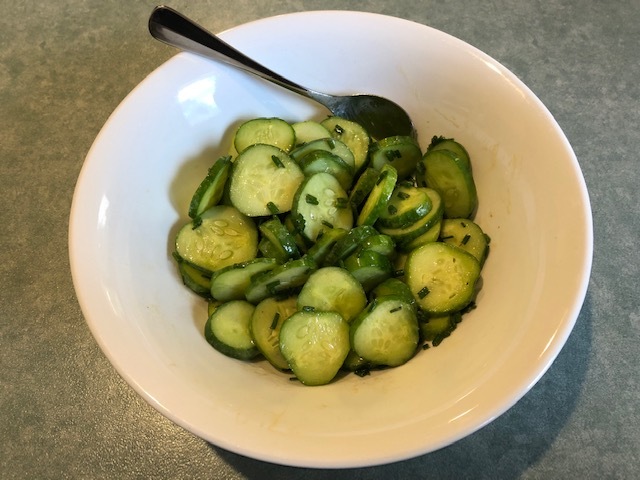 However, a short visit to the internet unearthed a deceptively simple recipe, which uses salt to concentrate the cucumber’s own flavour and convert it to a salad hero. Our method used old tea towels to press the slices dry after rinsing; we dressed it with our own vinaigrette; and we replaced the red onion with fresh chives from our kitchen garden. I swear it tasted more interesting than it looks! And it kept well for a day or so in the fridge. Next, the zucchini. They were always destined to be charred on the grill of our Weber Q, which is ridiculously easy to do. Trim the ends of each zucchini, then cut them lengthways into slices about 5mm thick. (Cut longer zucchini in half across beforehand.) Salt all the flesh lightly, on both sides, and leave for no more than 15 minutes. Rinse well and pat dry with kitchen paper or tea towels. Once the zucchini is dry, heat your grill and drizzle some olive oil over one side of each slice of zucchini. When the grill is hot enough to cook a piece of steak, place the zucchini oiled-side down on the grill, cook for 4 minutes, turn and cook for another 4 minutes and, if you think they need a bit more charring, put them back on the first side for another minute or so. Alright, that might not be intellectually challenging but it is a bit fiddly. So, to get a decent return on your time investment, complement the grilled zucchini with premium partners. We have two combinations to recommend. 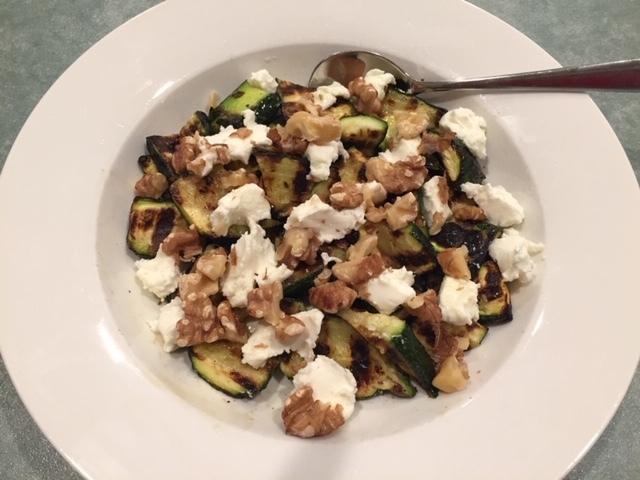 The first is to cut your zucchini slices into shorter lengths and toss them with pieces of toasted walnut and small pieces of soft feta, also known as Persian feta. No further dressing required. The second option was inspired by a recipe my friend Bill sent to me. (Bill was the first person I knew well who had cut carbs from his diet in order to fend off the threat of diabetes. So, it was delivered to my Inbox with the admonition to delete the croutons. We made it once, more or less following the recipe, and then we modified it to suit our palates. The biggest change was to replace the asparagus with our homegrown zucchini. Minor changes? Drop the parsley, so the basil could shine, and we used our vinaigrette rather than the vinegar. 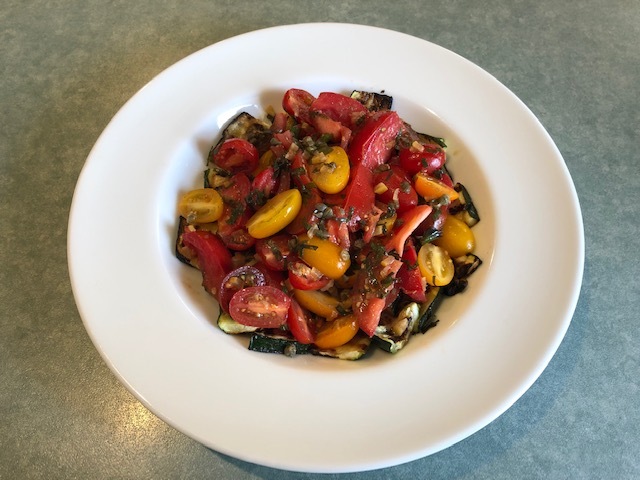 The oiliness of the zucchini is balanced by the acidity of the tomatoes. And the saltiness of the capers and preserved lemon is balanced by the bright flavours of the basil and tomatoes (we also used less salt than usual in our dressing). The result is a colourful salad, full of summertime flavours, delicious in its own right but also a great partner with grilled lamb or chicken or pan-fried white fish. The final salad of this post also uses soft feta. Bill and I meet a few times each year for lunch in central Melbourne. The most recent of these was a few days after I had received my warning about blood sugar. So, I was quite keen that we should fine a dining spot that offered some attractive low-carb lunch options. 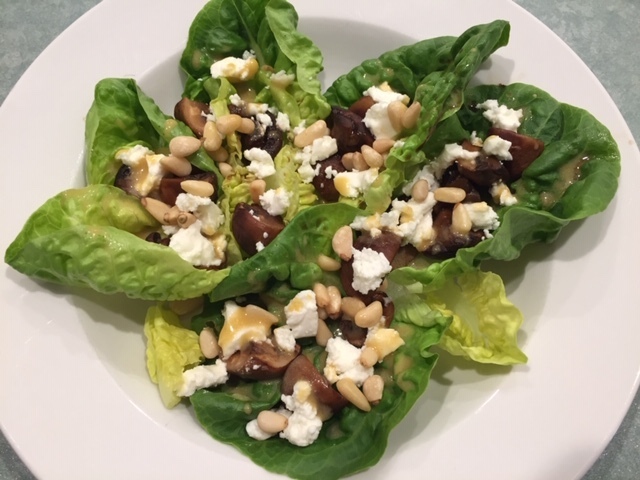 The end result was that I ate a salad of mixed leaves, grilled Portobello mushroom pieces, soft feta and some toasted pine nuts. Sounds simple but the flavour profile was quite complex and very more-ish. 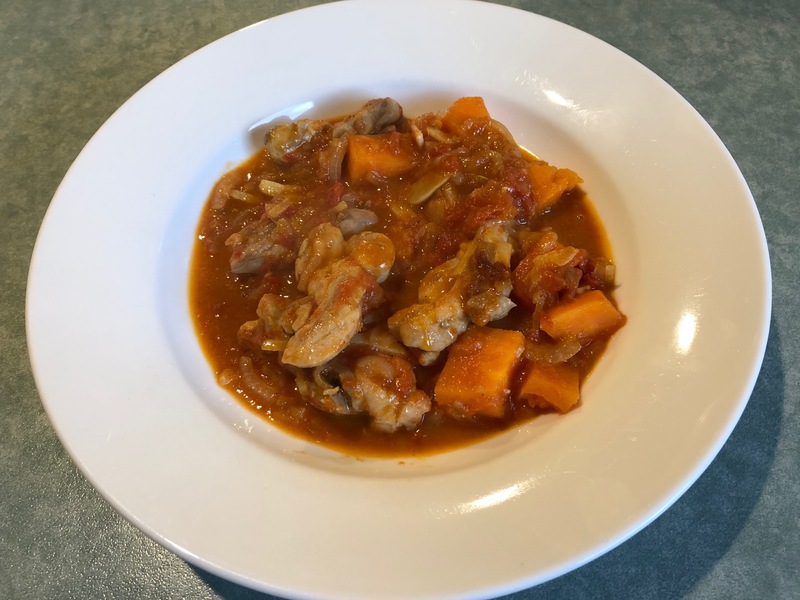 At home, I have produced a modified version several times, replacing the pine nuts with toasted walnuts and, for the mushroom element, gently frying chunks of Swiss Brown mushrooms and finishing them off with a bit of beef stock under a lid. It makes for a very satisfying light lunch and comes in handy on days when Maggie really wants a toasted ham sandwich! 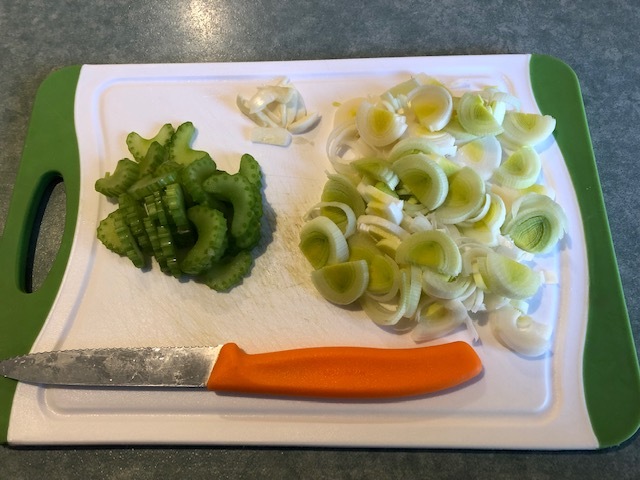 And now, after all those key-strokes and with Maggie due home from work soon, it is time for me to start lining up the ingredients for the salad that will form part of tonight’s summertime dinner and then feature in my next post. I mentioned in my previous post that Maggie took a liking to the Vietnamese salads served at the Da Nang resort where we holidayed in February. Think lots of fresh herb leaves and the distinctive mix of sweet and sour. So, we resolved to find a recipe for caramelised mango to use in our kitchen and then marry it with some prawns in a salad. 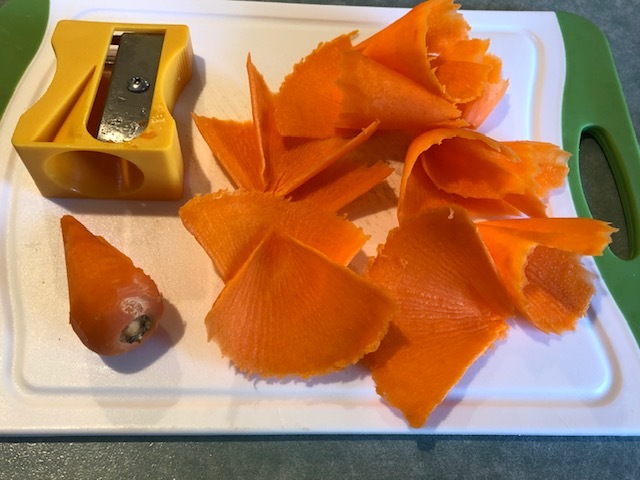 As for the caramelising, the only variations we made to the recipe were to use soft brown sugar and to reduce the ingredient volumes to suit just one mango, which produced enough for at least four serves of salad. And a tip: make sure that your pan/skillet is wide enough to leave space between the mango pieces; otherwise, they will stew! 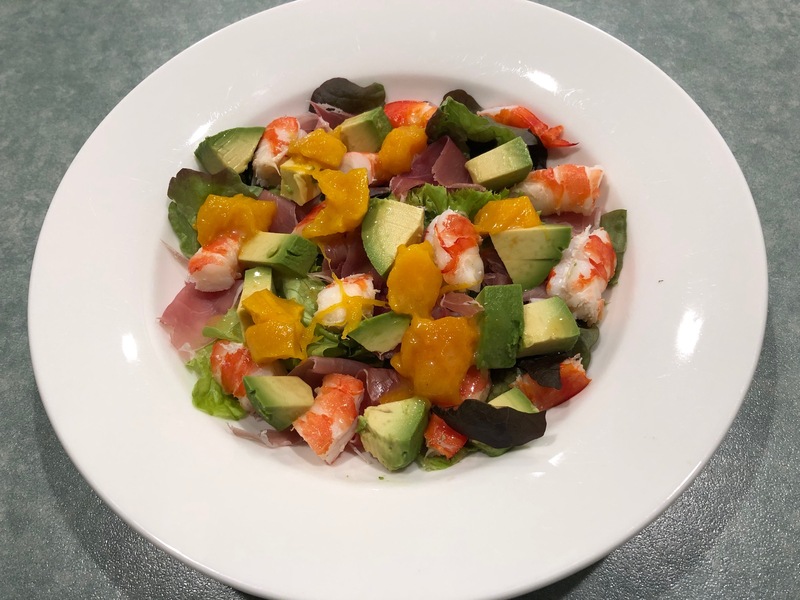 For the salad with mango, we combined some soft lettuce leaves, pieces of ripe avocado, prawn segments and small pieces of the caramelised fruit. We then dressed it with some homemade vinaigrette, to which we added some fresh lime juice and some of the cooking juices from the pan of mango. It looks pretty, doesn’t it? And it was delicious! In September 2008, Maggie and I flew to Rome to join a coach tour of Italy; it was our first overseas trip together. We met our tour guide – Marco the Magnifico – on the evening before the tour commenced. Addressing our group, he uttered the infamous words: “this is not a holiday; it’s a tour”! And that has been the case for all but a few days of our many subsequent travels – we go touring, either on an organised itinerary aboard a coach or a boat, or under our own steam, by car or train. 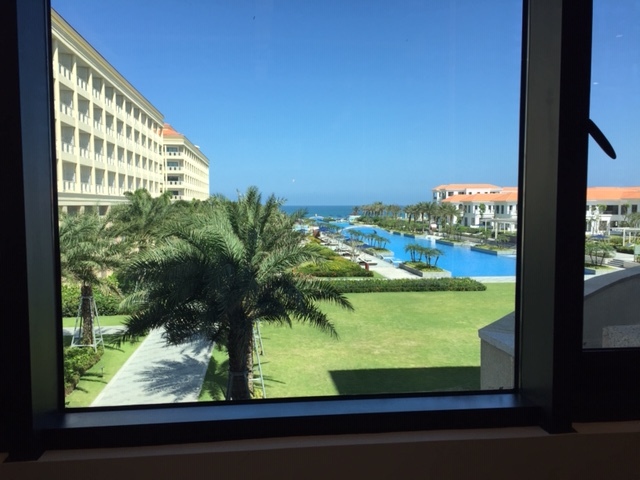 Last month, however, we broke away from our established pattern and travelled to a faraway resort – The Grand Sheraton Da Nang – and had a holiday. No wake-up calls, no repacking the luggage every second night. Just a beachside bar, an abundance of dining options, one of the world’s great mattresses for late awakenings and free-range siestas, and a swimming pool, all 210 metres of it at a constant waddling depth of 1.3 metres. We booked this holiday with a view to having a “taste” of Vietnam and then deciding if we would return for a thorough exploration, ie go touring. And “taste” we did, especially your correspondent. 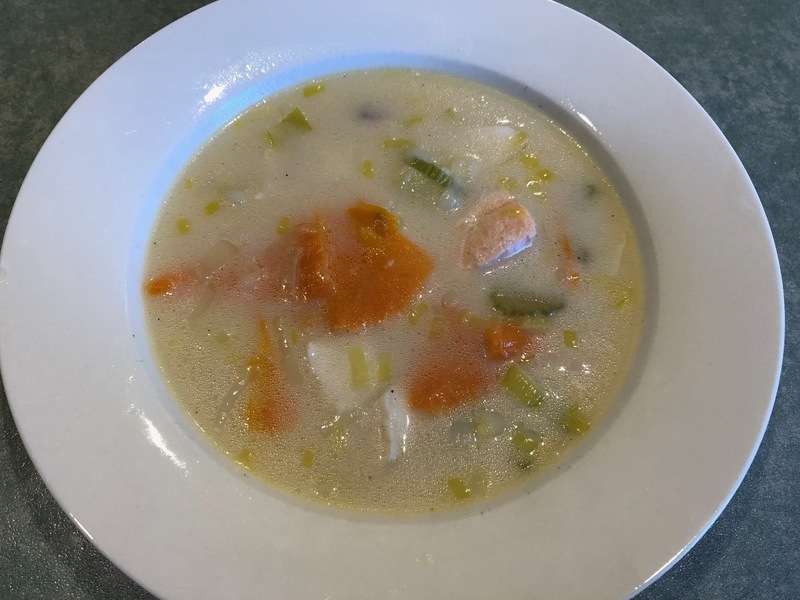 I would begin each day with a bowl of pho or similar and continue to select mostly Asian dishes from the diverse menus at the resort’s three main dining spaces. So0n enough, Maggie joined the party, finding the Vietnamese style of salads very attractive; more of that, in a follow-up post. 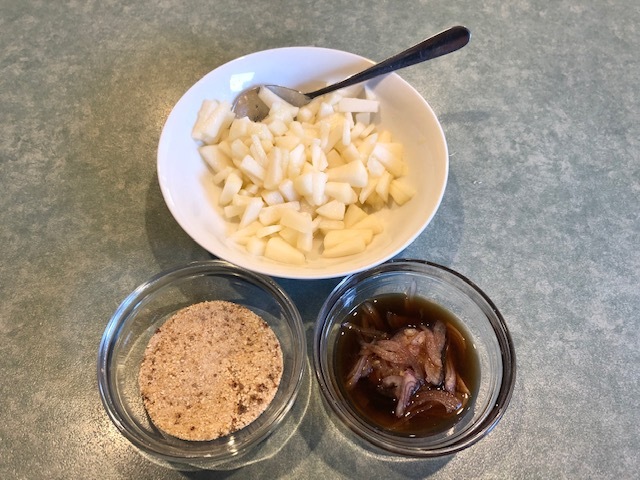 The duck larb I ate at the resort – not once, but twice – included some non-traditional, small, crunchy pieces of peeled pear, which added appealing texture and flavour variety. 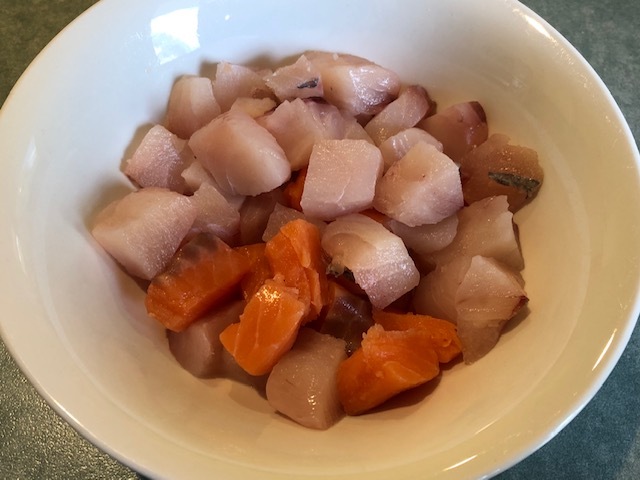 Once we were back home in Melbourne, we found a recipe that gave us a sound starting point, from which we added our own twists, including the fruit element. Peel the ginger and slice it finely (about 2mm). Dry roast the ginger in a small frypan over mild heat until dry and toasted (12-15 minutes). When cool, pound it in a mortar and pestle until finely ground. Set aside. Add rice to pan and cook over medium heat, shaking occasionally, until toasted (3-4 minutes). Tip into mortar and pestle and grind to a powder. Set aside. Pour vegetable oil into a flat-based wok to a depth of about 4mm and heat until hot. Add two-thirds of the shallot and stir occasionally until golden brown and crispy. Remove and drain on paper towel. Slice the duck skin into strips (about 8mm long), add to wok and turn occasionally until crisp and golden. Remove and drain on paper towel. Discard the oil and wipe out the wok. 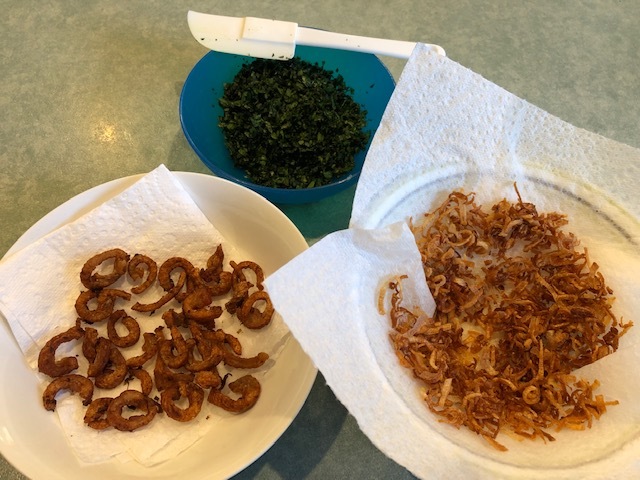 In the meantime, use three separate small bowls to combine fruit and 2 tsp lime juice; remaining shallot with fish sauce and 2 tsp lime juice; and 2 tsp ground rice, 1 tsp of the ground ginger, the chilli flakes and the sugar. Heat wok, add chopped duck meat and 2 tsp of water. Stir frequently until duck is cooked through (3-4 mins). Remove from heat. Spoon out excess liquid. Add the herbs and the contents of the three small bowls. Briefly stir to combine. 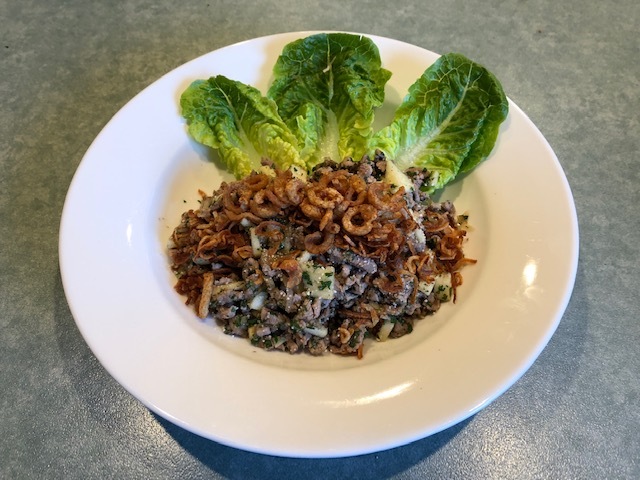 Serve scattered with the fried shallot, duck skin and 1 extra teaspoon of the rice powder with the cos lettuce leaves on the side.